“Interaction of Estrogenic Chemicals and Phytoestrogens with Estrogen Receptor β”. Endocrinology (Oxford University Press) 139 (10). (1998). doi:10.1210/endo.139.10.6216. ^ Yildiz, Fatih (2005). Phytoestrogens in Functional Foods. Taylor & Francis Ltd. pp. 3–5, 210–211. ISBN 978-1-57444-508-4. ^ a b “Dietary phytoestrogens and health”. Phytochemistry 65 (8). (2004). 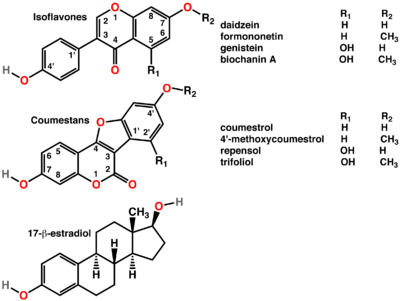 doi:10.1016/j.phytochem.2004.03.005. PMID 15110680. ^ “HPLCによる食品中の Daidzin, Daidzein, Genistin 及び Genistein の分別定量”. 食品衛生学雑誌 40 (6): 450-451. (1999). doi:10.3358/shokueishi.40.6_444. ^ a b c d e “Phytoestrogen Content of Foods Consumed in Canada, Including Isoflavones, Lignans, and Coumestan”. Nutrition and cancer 54 (2). (2006). doi:10.1207/s15327914nc5402_5. PMID 16898863. ^ a b “Vascular Effects of Phytoestrogens and Alternative Menopausal Hormone Therapy in Cardiovascular Disease”. Mini reviews in medicinal chemistry 12 (2). (2012). PMC: PMC3288319. PMID 22070687. https://www.ncbi.nlm.nih.gov/pmc/articles/PMCPMC3288319/.